Mito Inoue makes tiny quantities of wine and cider in the spectacular Auvergne region of central France. 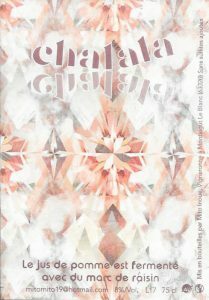 We had been communicating with winemaker Mito Inoue for a number of years but she has never had enough wine to allocate some to us. 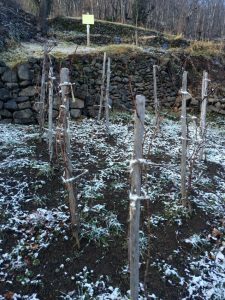 In 2015 we finally got the opportunity to visit her and see her tiny, tiny cellar and walk in her vineyards, despite snow covering the vertiginous slopes to which they precariously cling! She works in the Auvergne in central France in a village 30 minutes south of the main city of Clermont-Ferrand. We were introduced to her wines by Pierre Jancou when he owned Vivant in Paris. However, these are true “unicorn” wines – they are very hard to locate and there are very few of them. Mito has always been very gracious and has answered our emails and has kept in contact despite the last three vintages being incredibly low yielding. When we visited her cellar she only had one barrel of wine from the 2014 vintage – too little to satisfy her existing customers let alone us. After the tasting she offered to take us to see her Pinot Blanc vines which she has planted on a steep mountain-side about twenty minutes away from the village where we were tasting the wine. Mito warned us that the walk would be slippery and steep! 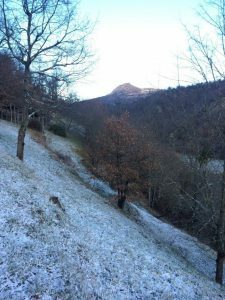 The slopes were covered in snow and the track wound up the mountain via dry-stone terraces that were being restored by volunteers. You can see the distant volcanic peak and the pale blue sky on this snowy afternoon as we walked up the snowy slopes to the terraces. 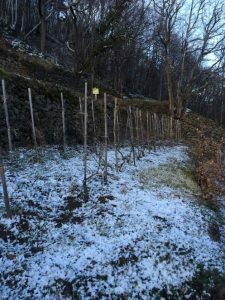 Our sedentary legs were not the ideal vehicles for this climb, but we persisted and eventually arrived at the top where the beautiful terraces were planted with two and three year old Pinot Blanc vines, looking stark and cold in the winter snow. It was a magical experience. Here is a photo of the terraces and the Pinot Blanc vines. The local name for these dry-stone terraces is “pailhats”. This was a cold, but thoroughly enjoyable afternoon! 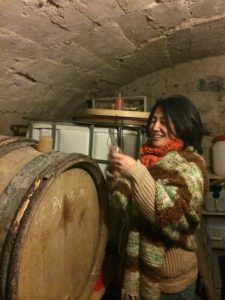 The Orbs was the wine that Mito made from her tiny 2016 harvest. It was made from mainly Gamay with some indigenous and unidentified Auvergne grapes added in small quantities. It is a beautiful and very individual wine that we were able to buy a small quantity of for Australia. For the second year running Mito has created an apple cider made from apples picked in the Auvergne. The twist is that she has fermented the apple juice on the lees of the 2016 Orbs red wine described above. We were delighted to visit her early in 2018 to try both the wine and the cider. When Mito was about to open the bottle of cider she apologised because she thought it had failed to ferment properly so was likely to be “flat”. We watched as she opened the bottle and a delightful smile spread across her face as she saw the bubbles rise out of the neck of the bottle! It is a beautiful drink with a pink colour derived from the wine must.